I have one word that defines today’s post topic – that being FINALLY. This happens to be one of those times when I was keenly aware that I was able to get a prized bird in the tin but it seems like it has been forever trying to get them processed and ready for publication. So, without any further delays, please say hello to my little friend. How cool is that! 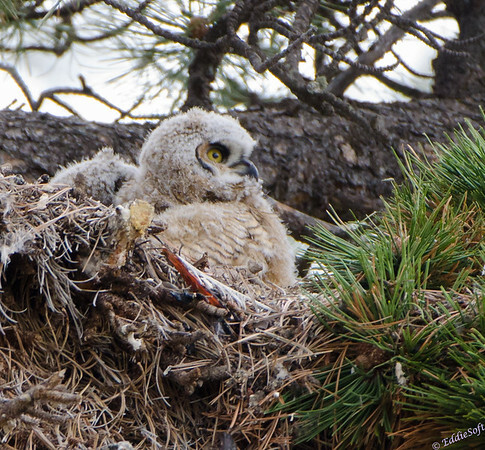 That is the cute and puffy offspring of a Great Horned Owl. 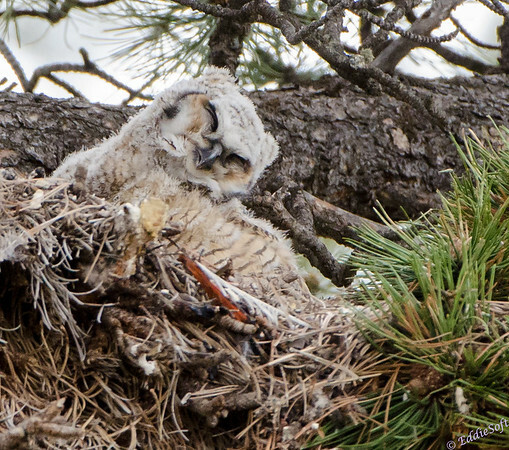 This particular nest was shot in the Rocky Mountain National Park back in May of 2014. Pretty sure I have mentioned this before, but we had traveled out to the Denver, Colorado area for the Teacup Dog Agility Nationals. As an incentive, Linda added in a side trip to the Rocky Mountain Park to check out the local wildlife. She knows me to well, I’m in the van and ready to go the minute I hear there’s a chance to spend some time in the mountains with The Beast. I should probably have said “say hello to my little friendS”. 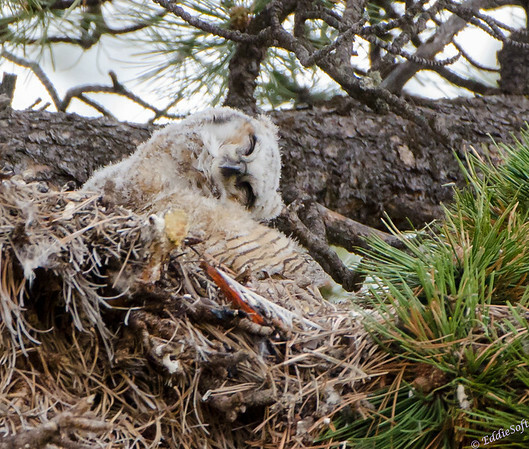 There were really two owlets in this brood. Unfortunately, the other one seemed a bit shyer than the one in front. In fact, for the longest time I thought there was only one until the second decided to pop his head out to see what was entertaining his brother (or sister) so much. Soon after it laid back down and nestled in for the rest of the shoot. I wish I could relay the story of how I trekked for hours in the backwoods of the park, battling altitude sickness and dehydration to the point my lips had cracks in them the size of the Grand Canyon. Oh, and had to fend off a 6 foot mother Grizzly concerned that I was threat to her three cubs only to stumble and fall off a rocky cliff landing directly on a rattle snake which quickly latched onto the end of my nose like a 6 foot snoot boot. Alas, that was another trip (ha). Truth is, this encounter was basically handed to us as we were on our way out of the park. Linda was driving (a likely bet I know), when we came upon a half dozen or so cars on the side of the road. In Yellowstone, this typically signifies that a newbies have seen their first Bison or there is a Bear hanging out in the area. We decided to ask the first person we saw what all the interest was about. Preparing for a Bison response, we were somewhat shocked when the answer was “an Owl nest”. No words were needed, Linda found an adequate place to park and we gathered up our equipment. Just realized that if you are a friend to Linda’s on Facebook you probably already know all about this since she tends to post her pictures there immediately in order to take dibs on the credit – always taking advantage of my huge backlog of processing. Thank god, that was a false alarm – neck is still attached to the rest of the furball – keep forgetting how nimble those owl necks are. Linda and I probably spent 1.5 to 2 hours just observing and snapping these beautiful creatures. 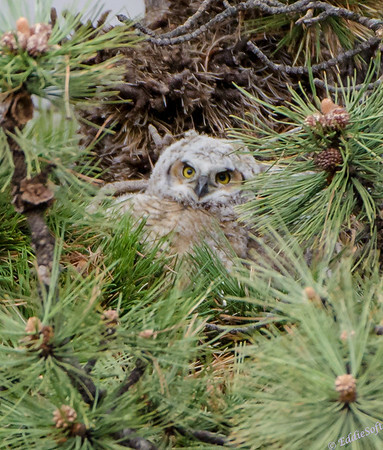 To be honest, it was difficult to get a clear shot of the Owlets through a rather small opening in the pine branches. Mommy did a good job keeping them somewhat concealed, but unfortunately, picked a spot rather close to a main road. She didn’t seem that concerned… whoops, hold on to that thought for an upcoming post. 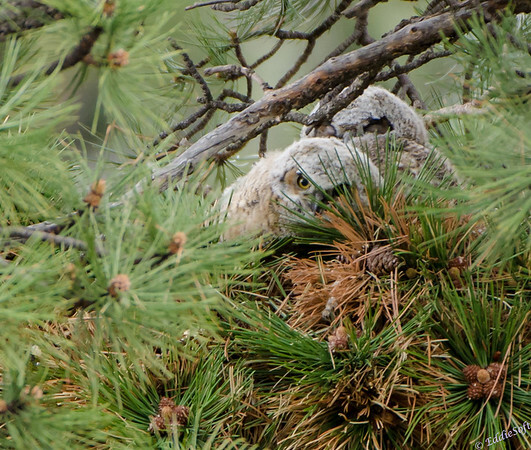 Eventually I found a decent vantage point on a nearby hill that gave me a fairly straight on shot to the nest (it was pretty high up in the pine tree). The Beast gave me advantage of distance closing allowing me to move further away from the rest of the crowd and take advantage of the terrain. I’ll save a lot of the details on the Great Horned Owl for an upcoming post – yes, there will be another. However, I will leave you with a couple of tidbits as reward for stopping by. 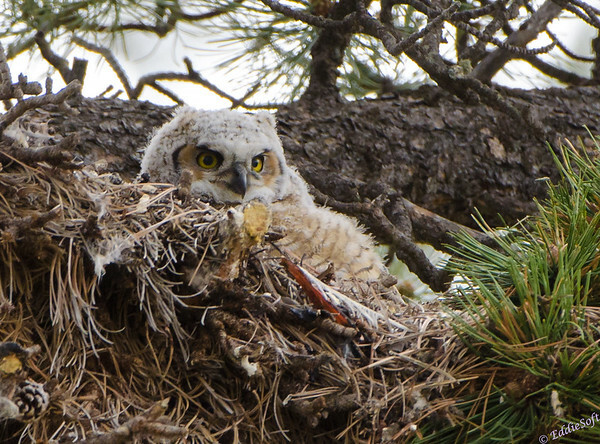 I found it interesting that Great Horned Owls do not usually build their own nests preferring instead to utilized homes built by other species like Hawks and Ravens. Guessing the mother Owl strolls up to the door, raps on the frame with a deadly talon and quizzes the current occupants what’s for dinner. Smart residents pack the kids up and get the hell out of Dodge knowing full well what that owl meant – as in what’s in here for MY dinner. Similar to Eagles, I figured that these nests were reused from year to year, but Cornell indicated that they deteriorate during the breeding cycle and rarely in shape for additional uses. 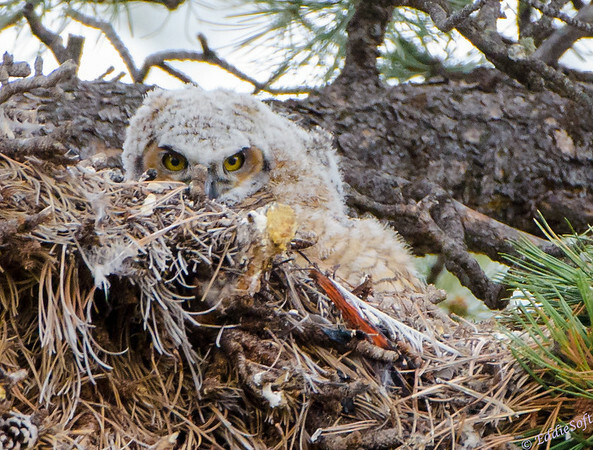 Lastly, these Owlets will move out of the nest onto nearby branches in the 5 week time frame and then around 10 weeks they are capable of flying. They do tend to be fed by parents up to several months. No sense in giving up a good thing too early hehehe. Well, that is all I have for you today – hope you enjoyed seeing the shots – I know I sure enjoyed the experience – they are just so damn cute which is in stark contrast to the efficient killers they will become in their adult life. Check back soon for the second part of this post. For now, I am finally going to put that +1 on my North American Bird List. Yes, very cute! I have yet to see baby owls of any kind. Around here they apparently just use hollows in trees to nest in. And their babies are the first ones to appear in late winter. I suspect the mother owl detected you two and came around. I’ll have to read about it. An awesome bird–thanks for the post and pics! Somewhat disappointed it didn’t attack you, as I know it would have attacked me! Nope, as noted in the next post, she was just sitting there watching us and insuring we didn’t cause any concern for her precious offspring (and we didn’t). Do you have any other Owls in your birding list yet – other than the one we spotted in Allerton. That Barred Owl was quite the surprise being out and about in the middle of the day. Linda and I have the pleasure of seeing them from time to time around here – mostly early in the morning on way to work or on the way home at dusk. Oh, and plenty occurrences of them calling out in our woods late at night. We have had one incredible sighting of a Great Horned in our backyard – we had just come back from a week vacation and there it was hanging out on the ground intently watching our bird feeder.